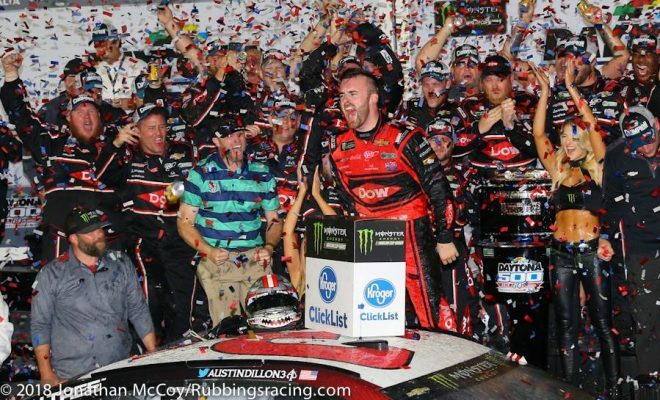 Daytona Beach, Fla — Austin Dillon won the 60th running of the Daytona 500, bringing the iconic No.3 Richard Childress Racing car back to Daytona International Speedway’s victory lane 20 years after Dale Earnhardt’s win. 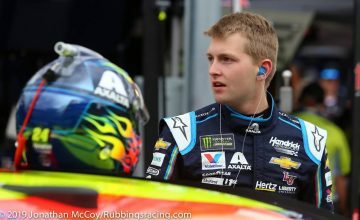 In overtime, with the white flag flying Dillon got to the rear bumper of Aric Almirola at the end of the backstretch, turning down the track Dillon hooked Almirola – wrecking him. NASCAR did not fly the yellow flag, letting the dwindled field race back to the start/finish line. “He got to my back bumper and was pushing and just hooked me … my heart is broken,” said Almirola after being released from the infield healthcare center. “Bubba gave me a heck of a push,” said Dillon in victory lane. 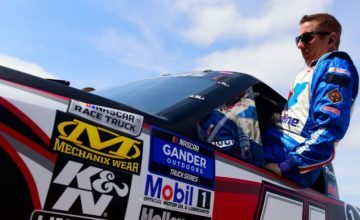 Austin Dillon relishes his Daytona 500 win. Photo by Jonathan McCoy. Coming in third was Denny Hamlin. The 2016 Daytona 500 champion led the way as the race entered overtime but the driver behind him, Chris Buescher, had a bad restart. Without the help from behind, Hamlin immediately lost the position. Almirola, who restarted second, took the lead. At the line Hamlin was edged out for second by Darrell Wallace Jr., the new driver of Richard Petty’s No. 43. After the start/finish line the pair of drivers wrecked. Wallace said, “it’s Daytona, Jesus Christ,” while taking a seat in the media center. Without time to receive his first question, Wallace was embraced by his crying mother. “We did,” replied his mom. After retaking his seat, Bubba as he is known, wept tears of joy, relief, and disbelief. Wallace’s finish is the highest by an African American competitor in the Daytona 500. Wendell Scott held the previous record with a 13th-place finish in 1966. 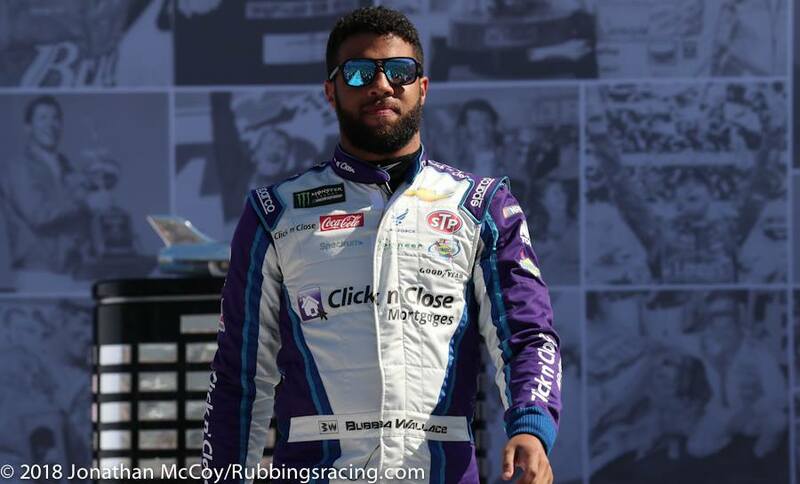 Darrell Wallace Jr. is walks across stage during driver introductions. Photo by Jonathan McCoy. Ryan Blaney, Wallace’s best friend, led a race high 118 laps but ended his Sunday with a seventh place finish. With two laps remaining in regulation, the Team Penske driver packed air around Kurt Busch’s rear bumper in turn-one, spinning out last year’s Daytona 500 champion – a 12-car wreck was the result. This wreck on lap 199 set up the overtime finish. Brad Keselowski and Joey Logano drove near the front all day, usually right behind or near their newly added third teammate. On lap 102 Keselowski and Chase Elliott tangled approaching turn-three. The two frontrunners totaled their cars, collecting Danica Patrick in the process. The same wreck also finished the day for Kevin Harvick and Kasey Kahne, who now drives for Leavine Family racing. The crew of Richard Childress’ No. 3 Dow Chevrolet celebrates with Austin Dillon. Photo by Jonathan McCoy. 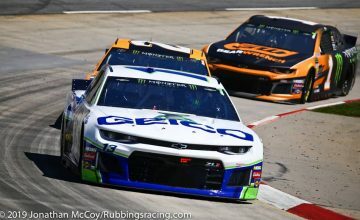 There wasn’t a definitive big-one, instead the 200 lap race was marked with three large crashes; the Keselowski and Elliott wreck in stage two, the Blaney and Busch ignited wreck on lap 199, and a pile-up on the final lap of the first stage. Blocking ran rampant in the 2018 Speedweeks. On lap 60, the very end of the first stage, Ricky Stenhouse Jr. threw a block on Blaney, nearly sending the No. 12 Ford out of control. Blaney managed to woe his car up, but the drivers behind him accordion’d. Erik Jones lost control of his No. 20 Toyota Camry to create a nine-car accident. After being cleared from the healthcare-center Jones declined to comment on his race. Jimmie Johnson, Daniel Suarez, and Ty Dillon would total their cars in the wreck.  Ricky Stenhouse Jr. pulls off an INCREDIBLE save, but sets off a big crash. Jimmie Johnson, Erik Jones, Daniel Suarez and William Byron involved. With so many formative cars out of contention plenty underdogs found themselves with good showings in the first race. JTG Daugherty racing finished with both team cars in the top-ten, Buescher finished fifth and AJ Allmendinger finished tenth. Justin Marks brought his Rick Ware Racing Chevrolet home in 12th, a solid showing for the underfunded team. Michael McDowell, who lost his ride with LFR over the off season drove the No. 34 Front Row Motorsports Ford to a ninth place finish. Only ten cars ended on the lead lap. Heading into next week’s race at Atlanta Motor Speedway, Blaney leads the points standings by eight points over Logano and 11 over Dillon and Wallace.